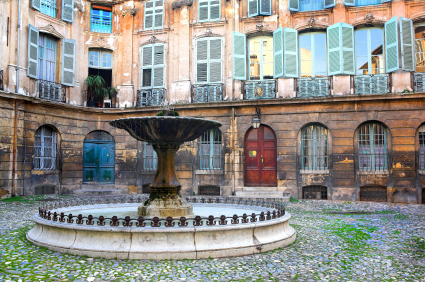 Courtyard with a fountain in Aix-en-Provence, France. Aix-en-Provence is still one of my favorite towns in my beloved France. I do love the Cours Mirabeau though it has lost some charm since being transformed into a walking street of sorts. 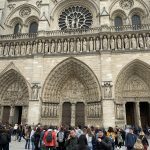 The “places et fontaines” close to Rome’s squares and fountains is still a big draw, and the town is filled with wonderful restaurants, churches, museums, and way too many shops but certainly addressing all budgets. Great sales right now. The evening market on Cours Mirabeau is always fun, and we all managed to find small gifts to bring home, from potteries to panama hats to espadrilles (forget tongs…French women love their espadrilles and the last few years they’ve made a strong comeback for their price, comfort and colorful stripes in addition to the classic plain ones). The Musée Granet is well worth a visit, and this summer the rich German collector Frieder Burda from the Burda family in Baden Baden is showing his collection: German and American art, mostly late twentieth century and a few goodies like seven Picassos from the late period which add to his eclectic taste or rather that of his father. Don’t miss the museum collection of 19th century painters and a lovely collection by Cezanne. Good meals at Amphitryon with their market menu, at Le Formal for its delicious pigeon, and for more reasonable prices at Epicurien for its green peppers stuffed with lamb confit, or at Bistrot des Philosophes for the daily special, and if you are a tomato lover enjoy the tatin of green tomatoes on their lovely terrace at La Tomate Verte. My favorite ice cream place still is Faure on Cours Mirabeau, though the competition is getting serious with many Italian gelateria shops opening everywhere. With the August heat ice cream business is booming everywhere…but know your ice cream and “artisanal” is a word to look for.